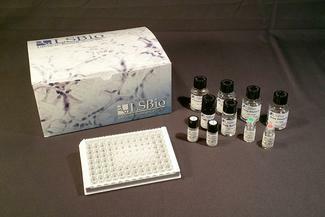 LS-F40244 is a 96-well enzyme-linked immunosorbent assay (ELISA) for the Quantitative detection of Human Anti-Ox LDL Antibody in samples of Plasma and Serum. It is based upon a Sandwich assay principle and can be used to detect levels of Anti-Ox LDL Antibody as low as 0.563 milli units per milliliter. Prepare all reagents, samples and standards. Add 100 ul standard or sample to each well and incubate for 90 minutes at 37°C. Aspirate and add 100 ul prepared Detection Antibody and incubate of 1 hour at 37°C. Aspirate and wash 3 times. Add 100 ul HRP Conjugate and incubate for 30 minutes at 37°C. Aspirate and wash 5 times. Add 90 ul Substrate Solution and incubate for 15-20 minutes at 37°C. Add 50 ul Stop Solution.Read immediately at 450nm.